Ok so I’ve had a surprising amount of traffic generated by my Dungeon Command playtest preview, and I want to follow that up with something cool but very different. I love designing encounters. I feel like fourth edition lends it self very well to game design, and there’s so many things to tinker around with. So I thought that I’d run a series here, where I share some of the better encounters that I have created for 4E. These will not be your familiar two page spreads, won’t have a detailed map or the entire encounter scripted out. I would like for you to view these as toolboxes – you can change and reshape these encounters into whatever you’d like them to be. I present you with a core, and some ideas of how to develop it, but the rest is in your hands. This encounter is designed to work in any adventure. As the title suggests, the encounter essentially is an intruder alarm, (and a very sophisticated and effective one). It is up to you, as a DM, to decide who is using this burgler alarm: it might be a deranged wizard who’s protecting her tower from pesky intruders trying to steal her research, or it could be set up at the entrance of a base for fanatic cultists. You know your adventure better than anyone, and you should have no trouble inserting this. I ran it in an adventure set in Hammerfast, at the entrance of the dragon Calastryx’s lair, at the end of Heroic tier. 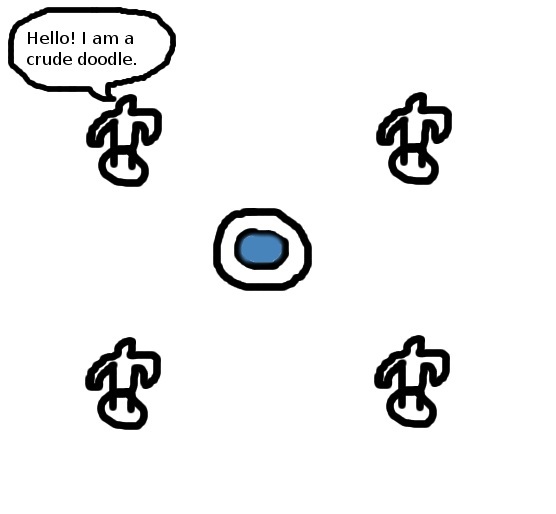 My friend Simon completely ‘refluffed’ this encounter to work in his Dark Sun campaign. In any case, the alarm system should be set up in the entrance room of what is effectively a dungeon. Ideally there are only two exits in this room, one leading to outside the dungeon (where PCs come in) and one leading into the dungeon. The room should be at least 11×11 square size. It doesn’t have to be set to a rectangular shape – as long as there is enough ample space in the middle to maneuver – things should run fine. The center of the room should have some sort of a basin that holds a special liquid, to which we’ll refer to as ‘sound water’. The basin can be anything – in my adventure it was simply a pilar with a concave top with the sound water poured into it. In Simon’s adventure it was an immobile magical gong, simply because water is not very appropriate in Dark Sun. The basin has it’s own stat block. There should also be four statues in the room that are diametrically opposed. You can determine the distance between the statues and the fountain yourself, but I would recommend it to be three to four squares appart. At this point I would like to appologise for my drawing skills. Just saying. holding the ‘sound water’. 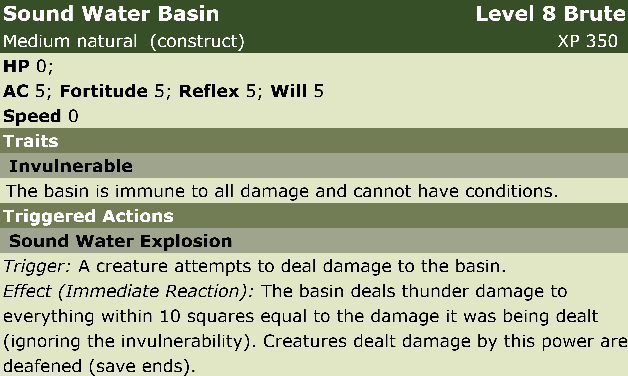 As soon as they are within reach, they will hit the sound water with their hammers, severely debilitating the adventuring party and possibly killing them. This will also produce a sound loud enough to alert anyone within the entire dungeon. Therefore the goal of the adventurers should be to stop the statues before they reach the basin. If they somehow fail to do this, but survive, suggest to your players that retreat is always an option. Maybe they can lick their wounds and attempt again. On the other hand, they might completely ignore the trap and venture forth into the dungeon – great! The statues will hit the basin within seconds and alert everyone to their presence, increasing the difficulty of every encounter in the dungeon. They might also decide to spill the water in the basin. Great, the water makes a tremendous sound alerting everyone in the dungeon. If they do decide to stay and fight the statues, give them clues of what the statues are trying to achieve by describing their movement. This encounter should flip the familiar rules of combat upside down, and make your players thinkoutside of the box. Powers that daze are usually valued highly, but in this case they simply stop the statues from attacking, which might seem beneficial, but that’s all it does – which is ok, since the main priority is for them to reach the basin. As soon as they do – they’ve won. Powers that pull, push, slide or prone however are much better, since they lock the statues down. Your melee players will find it very tough since the damge output at the start of the encounter is pretty big. As the encounter progresses, the output will be big enough to knock out even the toughest defenders. Describe every statue having a different color rune. When it fades out – have that rune light up on every other statue. This will serve as a hint to the players that the statues ‘power up’ when one of them falls. 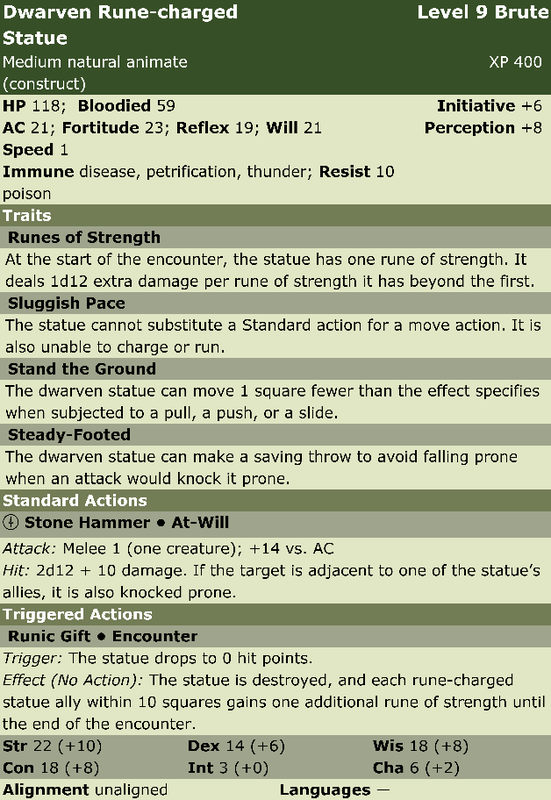 I have included two sets of stats for the statues. One is of regular difficulty, designed for a standard five player adventuring group of level 8, and the dwarven one is in ‘nightmare mode’ – a stat block for an optimized group, or one that is very good at controlling the battlefield. p.s. 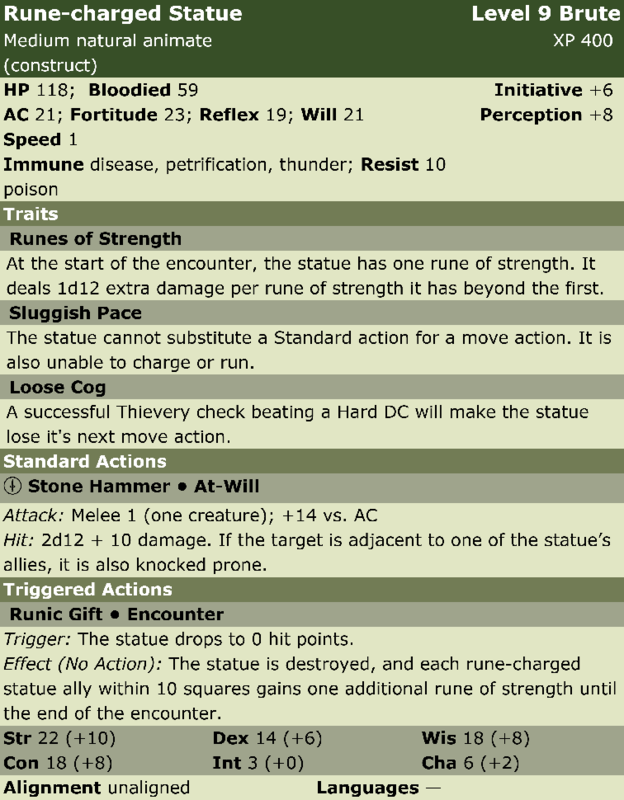 Big thank you to Logan Bonner – it was his monster design that inspired this encounter, and the monster stat block is an altered version of his Runic Statue from the Runecutter’s Ruin adventure found in Dragon #186.